Unemployed chef Thomas Jimenez, of West Philadelphia, center, would like to get a job as a chef in a suburban country club where the pay would be better. But he doesn't own a car and can't get to those jobs. Jimenez attended a news conference held by the Philadelphia Unemployment Project, which is advocating for more funding for a van pool program to take city residents to work in the suburbs. Unemployed chef Thomas Jimenez, 56, said he can cook anything, but if he wanted to impress, he'd choose seafood with a classic French velouté sauce. Or, wait for inspiration to strike. "A chef is like an artist," he said. "I don't know what I'm going to do until I pick up my brush. That's the challenge that I like." Jimenez, of West Philadelphia, recently lost his job as a supermarket chef. Now he's looking. First choice would be a country club or hotel in the suburbs. "That's pretty much where most of the good jobs that pay well are." But those suburban jobs are inaccessible for many Philadelphia residents such as Jimenez, who don't own cars and have no way to get to work. 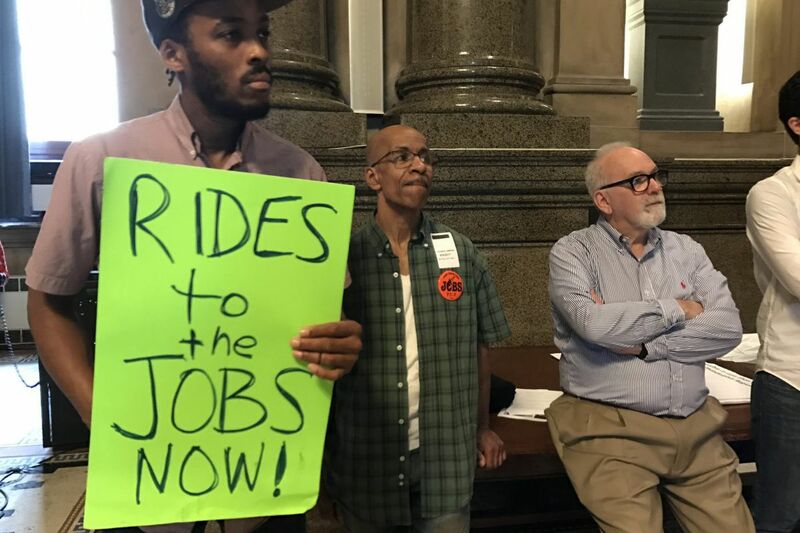 "Jobs are available in the suburbs, but far too few of our citizens can reach them," said John Dodds, director of the Philadelphia Unemployment Project (PUP), which advocates for the jobless. Dodds and a coalition of advocacy, labor, and religious groups want City Council to appropriate $750,000 to revive PUP's Commuter Options program that in 2008 provided daily transportation to suburban jobs for about 150 city dwellers. Less than a quarter of the jobs in the Philadelphia area can be accessed within 90 minutes by mass transit, one of the lowest percentages among the nation’s large metro areas. Currently, the program runs 13 car pools with $360,000 from the Pennsylvania Department of Transportation. Each car pool serves four to five reverse commuters. The two funding streams would total $1.1 million and allow 300 workers in 75 car pools to get to suburban jobs. "We think it's a moral issue," Dodds said. At PUP's news conference Monday, City councilmen Curtis Jones Jr. and Derek Green said they would propose the funding. The coalition says SEPTA's system centers on an outdated reality: suburban dweller commuting to city job. In 1970, about half of the region's jobs were based in Philadelphia, the coalition said in a letter to Council. By 2013, only one in four jobs were in Philadelphia, as urban employment declined and suburban jobs increased. Meanwhile, the city has a higher unemployment rate, 6 percent in March, compared to suburban rates of 3.5 percent to 4.4 percent. SEPTA's assistant general manager, Francis Kelly, said SEPTA has expanded suburban options. "Our ridership has increased over the last five years and a lot of it has to do with the reverse commute," he said. He said the "Commuter Option" car pool program run by the Philadelphia Unemployment Project is another option for city dwellers. Kevin Liddie, 24, of Northeast Philadelphia, and three co-workers from Northeast Philadelphia use a Commuter Option car pool to get to overnight jobs at Amazon's King of Prussia warehouse. "I couldn't work there without the program," said Liddie, who drives the car pool. He and the others pay $6 each daily to PUP for round trip rides. PUP partners with a rental car agency for the vehicles. Liddie keeps the car, making sure everyone gets to work. More than four out of 10 jobs in Bucks County are not accessible by mass transit, the highest percentage among counties in Southeastern Pennsylvania. The money pays for gas and some expenses, but doesn't cover car rental and insurance. Even if buses ran at the right time for Liddie, the commute would be excruciating — from Northeast Philadelphia to Center City and then by bus to King of Prussia. The coalition cited a Delaware Valley Regional Planning Commission study saying that only half of residents in North and West Philadelphia neighborhoods have private vehicles. Meanwhile, 42 percent of jobs in Bucks County can't be reached by public transportation. Another survey, by Temple University's Institute of Survey Research, found that lack of transportation was the biggest barrier to employment, with 39 percent of respondents below the poverty line saying that not being able to get to work was more of an obstacle than a criminal history, child care problems or language barriers.